HALIFAX, Nova Scotia — Among the graves of Fairview Lawn Cemetery, there is one that was a magnet for bouquets and weeping girls in the 1990s. The name on the tombstone: J. Dawson. Jack Dawson, you will recall, is the name of the character played by Leonardo DiCaprio in the 1997 film "Titanic." And this cemetery is the final resting place of more victims of the Titanic than any other. Now, with the movie's re-release in 3D and the upcoming 100th anniversary of the disaster, keepers of the cemetery expect more flowers, love notes and more weeping — though James Cameron, the film's director, has said there's no connection between his Jack Dawson and the J. Dawson buried here. This is a place that has a deep connection to the tragedy. Halifax is 1,100 kilometers west of the spot where the ocean liner hit an iceberg; the ships bringing bodies back to land arriving starting late in April. Families came to claim the remains of their loved ones, and funerals and memorial services followed. 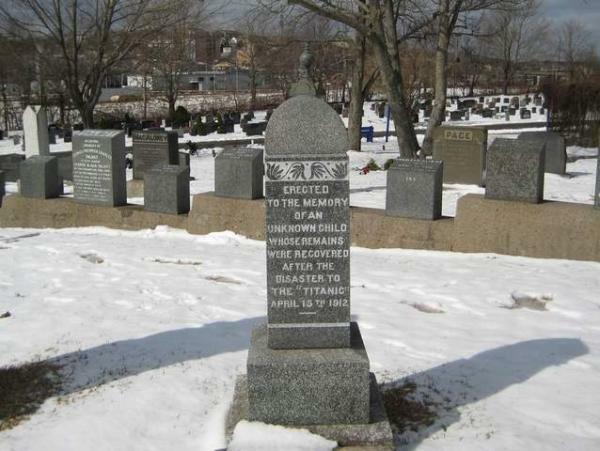 Altogether, 150 of the Titanic's dead are buried in three cemeteries. Gerry Lunn, curator of Halifax's Maritime Museum of the Atlantic, said this city was in mourning for months after the disaster, with much of its downtown draped in black bunting. "This was not just a one-night story," he said. "It may have been for the ship and the victims, but for Halifax this story went on for months and months and hasn't ended to this day." On April 15, the anniversary of the sinking, a candlelight procession will be followed by an interfaith memorial service at Fairview Lawn; flares will be set off at the time the ship began sinking; and the Nova Scotia provincial government will tweet the Titanic's final emergency messages. The Five Fishermen Restaurant and Grill — housed in the building where a funeral home handled the bodies of wealthier victims such as millionaire John Jacob Astor — is offering an April menu inspired by the Titanic's first-class fare. And the maritime museum is mounting an exhibit of pictures and stories of the 150 Titanic victims buried in Halifax graveyards — 19 in the Catholic Mount Olivet Cemetery, 10 in the Jewish Baron de Hirsch Cemetery, and 121 in non-denominational Fairview Lawn. Among items on display in the museum's permanent collection is a Titanic deck chair given to the minister who performed services on one of the ships that recovered bodies. The most touching artifact is a pair of shoes, donated to the museum by a descendant of a Halifax police officer. They belonged to the nameless child who came to symbolize the many children who died aboard the Titanic. In 2002, Canadian researchers identified him as a 13-month-old Finnish boy, Eino Viljami Panula. But in 2007, DNA testing determined that he was in fact a 19-month-old English boy, Sidney Leslie Goodwin, who died with his entire family, including five siblings, as they were sailing to a new life in America. The child's headstone remains among the nameless ones at Fairview Lawn, each inscribed: "Died April 15, 1912." The bodies were numbered as they were picked up; the numbers appear on the headstones of the known and unknown victims. That the J. Dawson buried here is not the character in the movie did not stop the flow of mourners, said cemetery tour guide Blair Beed, a Halifax historian and grandson of an undertaker's assistant at the funeral home. "After the movie I saw fathers with their daughters standing here crying. For two or three years that lasted. Instead of spring break fathers would bring their daughters here to see J. Dawson," he said. The real J. Dawson, or Joseph Dawson, shoveled coal in the bowels of the ship and didn't win his Titanic ticket gambling as DiCaprio's character did. "It wasn't until after the movie came out that we found out that there was a J. Dawson gravestone," said the film's producer, Jon Landau, in an interview. Whoever J. Dawson was, "He received more notoriety decades after his death than he ever would have had in life," said Lunn, curator of maritime museum, which saw its attendance more than double, to 250,000, in the year after the film opened. The headstones are assembled in the shape of a ship. Among them is that of John Law Hume, violinist in the band that played on as the Titanic sank. Somebody recently left a little replica of a violin by his gravestone. Beed said it's not just teenage girls who choke up in the cemetery. "All of a sudden seeing the names on the stones, they are emotional, men and women. It's like 'I've heard this story all my life and here are the remains and here are the names.' It's 121 in this cemetery and it's four rows. And all of sudden the story is real," Beed said.